As London Fashion Week is fast approaching and London prepares for the spectacular of shows and events that emerge around this prestigious week, Illamasqua want to invite you to celebrate with us at Haute! 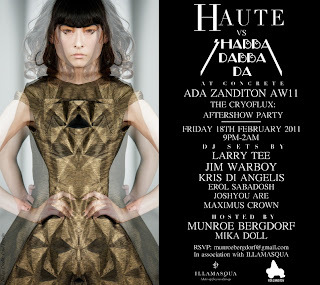 This London Fashion Week sees two of East London’s hottest clubs HAUTE! and SHABBA-DABBA-DA! 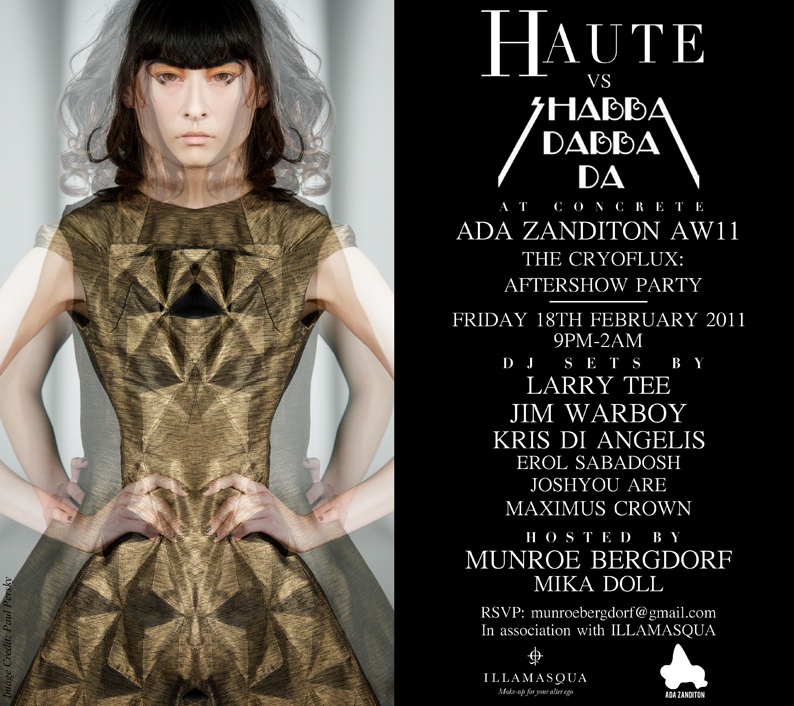 collaborating to celebrate the AW11 collection from London based designer ADA ZANDITON…and Illamasqua are proud to be the sponsors of the night! Ada Zanditon is an innovative ethical fashion designer creating women’s ready to wear. Her sculptural creative designs are made using sustainable materials and manufacturing. Ada Zanditon creates high end women’s wear that is elegant, fashion forward women’s wear that is both sustainably and ethically designed, to push the boundaries of what sustainable fashion can be. As Illamasqua is the product of a heady mix of influences with roots that stem from the rich heritage of make-up for film and theatre, our collaboration with Ada and the club nights Haute! and Shabba-Dabba-Da confirm Illamasqua’s presence among the alternative scenes. The infamous Munroe Bergdorf, Daniel Lismore and Illamasqua’s International Make-Up artist Mika will be hosting Haute!’s 3rdnight this Friday 18th February…so hurry to get your name on the guestlist for the hottest club night now!